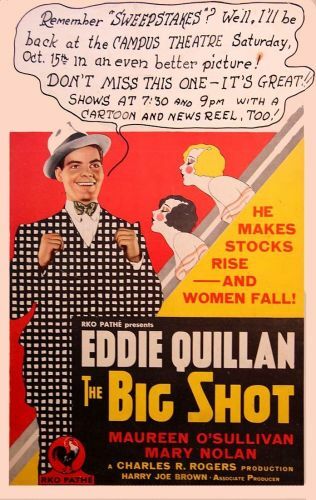 The Big Shot is Ray (Eddie Quillan), a go-getting but incredibly naïve real estate speculator. Duped into purchasing some worthless swamp land, Ray is kept in the dark by the villains when the land turns out to be harboring a profitable sulphur spring. On the verge of selling back the property at a ridiculously low sum, our hero is saved from making a sap of himself again by true-blue heroine Doris (Maureen O'Sullivan). The film is at its best when former Mack Sennett star Eddie Quillan converses with an octogenarian Civil War veteran, played by another alumni of silent two-reelers, Arthur Stone. The Big Shot was released in Great Britain as The Optimist, lest English audiences mistake it for a war picture.